William Hampton was born in Cornwall in 1854. In his youth he was employed in the tin mines, and when not mining he also tended for a nearby doctor’s horses. In 1873, encouraged by a friend, he left for Colorado to mine for gold. Here he met Amanda Olver. Amanda was born in Devonshire in 1860 and her family had also gone to Colorado in 1873. 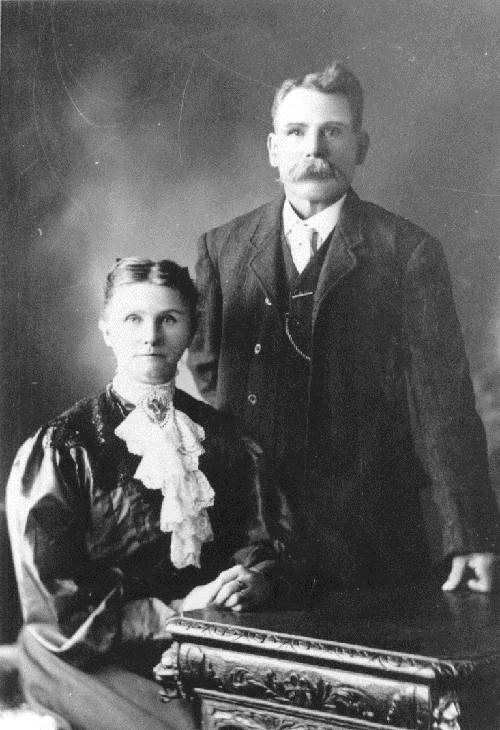 They married in 1876. In Colorado William also met John Laity, and in 1879 the two decided that they would give up mining for farming, so they set out for BC in search of good land. Much of the best land was already taken, and after looking at some other areas they chose Maple Ridge. They bought land from John Hammond, and they were joined by their families in the spring. William sold his Colorado gold watch to buy his first cow, and also bought chickens, pigs, a pair of oxen, and a collie dog. Soon they cleared land for a barn and new house, which was built by Samuel Edge. The new house had gardens on the west and north sides and the barn was built using felled trees and with the labour of a barn-raising bee. The first dairy was a log house and the cows were milked by hand. The family traded the produce from the farm for flour, rice, and sugar in New Westminster. William had raised an extra pair of oxen which he sold for the clearing of the road in Stanley Park. Around this time he also bought his first Jersey cow. He found that the milk was richer with more butterfat, so he decided to buy more Jersey cows and a bull as well. Though the farm did well the Hampton family was not without their share of tragedy. One daughter died of illness when she was only ten months old and two more children, Philip and Clara, died in the winter of 1888-1889 from a diphtheria outbreak in which many other families also lost children. Their son James also had a close call one day with a mower. Of the fourteen Hampton children, eleven lived to adulthood. 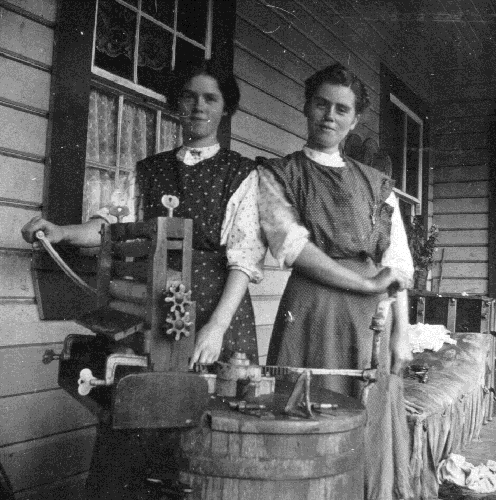 Vina and Annie [R] Hampton doing laundry on the porch in 1912. 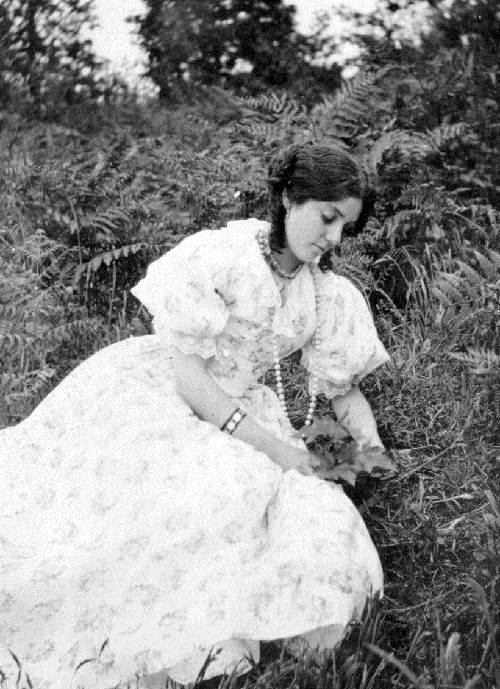 Alma Hampton, who would marry Bill Ward and later write her family’s history, in 1914. William remained in contact with his family back in Cornwall and in 1910 visited them for the first time in thirty-seven years while on a trip with Mr. Lazenby and Algernon Laity. Two of his nephews, Josiah James and Wilfred McCreath had already come to Maple Ridge. Josiah worked on the Hampton farm and Wilfred worked on Jim Chatwin’s farm. One of his nieces married Algernon Laity, and her sister also moved out to Maple Ridge. William Hampton died in 1933. Amanda remained in the family home and was cared for by Oliver and daughter-in-law Alice until she moved into a nursing home. She passed away in 1919 at the age of 89. Alma gave a valued gift to her family and to all those in Maple Ridge who cherish history when she wrote a detailed memoir, A Pioneer’s Heritage – The Story of William and Amanda Hampton. This was brought out in 1979 on the 100th anniversary of their arrival in Maple Ridge. Alma Ward presented a copy to Daphne Sleigh, then curator of the Maple Ridge Museum.